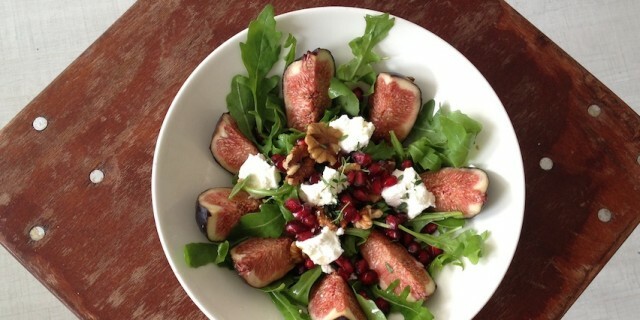 I love this Pomegranate Figs Goat Cheese Salad and I love fig season! Today I saw the first Italian figs of the season in my local organic store and I couldn’t wait to get my hands on them and make this salad. I love fresh figs. I think they are about my favorite fruit in the world. Fresh figs are great on their own but I love combining them with a soft goat’s cheese and salad greens. When you buy beautiful, ripe figs, make sure you use them quickly as they go bad quite quickly. I used a French Goat’s cheese with truffles from the Perigord made by Fromagerie Soreda. You can buy it at ‘t Kaasboertje on the Gerard Doustraat in de Pijp. It’s a very lovely soft cheese with a mild truffle flavor, which goes really well with the figs. For the dresssing I used fig balsamic vinegar. Fig balsamic is absolutely fantastic. I got mine as a present. I think it’s from Oil and Vinegar. They sell a really nice Figs Balsamic Glaze by the Italian vinegar makers, Mussini, known for their high quality balsamic vinegars. This sounds like a great alternative too. It’s quite sweet and syrupy. If you like more acidity, I recommend sticking with the (fig) balsamic vinegar. I fell in love with figs many years ago when we were travelling through Andalucia. We were staying in an amazing B&B up in the mountains of Andalucía. On the property were two big fig trees full of ripe, delicious plump figs. The owners of the B&B didn’t have time to pick the figs. But we couldn’t stand seeing all this beautiful produce going to waste. Instead of going on a day of sight-seeing, we decided to spend a day at the B&B picking figs. They were probably the last (black) figs of the season (it was an unusual warm late September). They were almost at the tipping point of getting spoiled, so ripe that their skin was breaking open. They were definitely the best figs I have ever tasted; they were sweet, sticky and succulent. I don’t believe I ever ate so many figs in my life. We had figs for for breakfast, lunch and dinner. Cut the pomegranate in half. Hold it over a bowl and use the back of a wooden spoon on the skin part of the fruit to knock out the seeds. Make sure to remove any white skin from the seeds, as it’s quite bitter. In a small bowl mix the dressing ingredients together. Season to taste with freshly ground black pepper and sea salt. Add arugula to a medium-sized salad bowl and add about half of the dressing. Mix it gently in using your hands. Add the figs, walnuts and pomegranate seeds. Place generous dollops of goat’s cheese on top of the salad. I just use my hands to break the cheese in smaller pieces. Drizzle with the rest of the dressing and sprinkle some fresh thyme leaves on top.